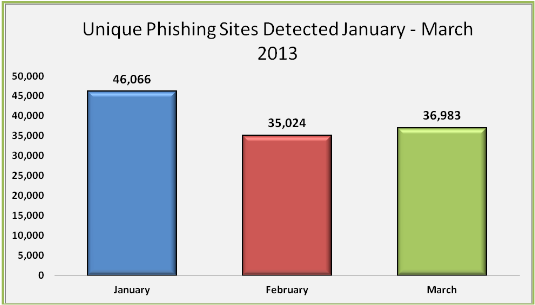 In general, reducing the number of phishing attacks from January to March 2013 was 20%. As a result, the volume of phishing indicators are the lowest in all the time since October 2011. According to experts, this can be explained by the reduced number of virtual servers, which are carried out with a phishing attack. It is estimated Co Anti-Phishing Working Group Rasmunsena Rod (Rod Rasmussen), the number of phishing sites hosted on these servers, decreased over the period from October 2012 to February 2013 from 14,400 to 1,653. “Such a drastic reduction in their number could mean that hackers have begun using the servers is not for phishing attacks, and to spread malware, or DoS-attacks,” explains Rasmunsen. Decreased and the number of brands that are the target of phishers. The maximum was reached in November 2012 and reached 430 positions. And in February, the figure was 348 and was the lowest since November 2011. In I quarter 2013 to first place in demand among phishers out payment systems, ahead of financial institutions and the media. The average worldwide infection of computers in the study period was 31%. The most positive is still China, more than half of all computers country. And the most “pure” country this time was Finland (17%). In Russia 36.2% of computers are infected. The experts say that 92% of users have not learned how to recognize phishing emails. The situation is exacerbated by the fact that phishing is aimed at a specific purpose, and phishing emails are becoming more realistic and difficult to identify.